Are you going places? The Carry-On Checklist: Make sure you don’t end up paying more for your baggage than you paid for your airline ticket. We’re all guilty of over stuffing our checked-in luggage and then shoving all the extras into our free carry-on baggage. Nobody needs a hefty excess baggage charge after months of preparing for our travels. Some airlines are considering scrapping free carry-on baggage altogether, so figure out how to pack wisely now before you learn the hard way. Before you start working on your carry on checklist, find out exactly what your airline allows you to board with. Most of them are pretty generous when it comes to carry-ons. The average restriction is one bag of 15 lbs measuring 22 inches x 16 inches x 8 inches. Experienced frequent flyers have mastered the art of packing a year’s worth of gear into their carry-on baggage. We have restricted our carry on checklist to include just the essentials (and a few extras) for a long flight. Effective packing begins with a good bag. A 40 liters pack weighing in at under 3 lbs is a good choice. You may want to choose one with a separate section for a laptop or lose the extra compartments and go for the lightest weight. You can fit more into a square bag than one with rounded corners. Compression straps will reduce the amount of cabin space you take up. It’s going to be a long, possibly bumpy ride. If you battle to sleep on an airplane, we recommend slipping a mild sleeping pill into your pocket in case you need it. There are times when sleep is out of the question and books are the answer here. If you don’t have a Kindle or can’t take one on the flight, a small stash of magazines is just the trick. You can always donate them to someone else afterward. Several airlines are starting to offer in-flight Wi-Fi nowadays. If yours does, a tablet or iPad could save you hours of boredom. You could also stock up on movies before you leave and watch them during the flight. Don’t forget a pair of lightweight headphones to avoid alienating your traveling companions. The amount of electronic firepower you should pack is a matter of preference and need. All electronics should be transported in your carry on bag for safety’s sake. If you want to update your social media profiles and stay in touch with family and friends at home, a smart phone should be sufficient. Make sure you have it all set up for international roaming and sim cards in advance to avoid stress on arrival. Unless you really want high-end photographs, your smart phone will do a great job of recording all your memories. Other options are a GoPro, compact waterproof camera or Mirrorless. Pack a tiny tripod into your camera bag and don’t forget the selfie stick. Those who need to work online while abroad or perform more complex technological tasks will need a lightweight laptop or notebook. A laptop sleeve is an added bonus if you are traveling with one of these devices. You don’t want to lug your carry-on bag with you wherever your laptop goes. Slip a compact USB with high storage capacity into a side pocket for storing photos and backing up your work. Do not forget a compatible charger, there is no guarantee that you will find one at your destination. You can purchase a suitable adapter on arrival to save space now. A USB battery pack is an optional nice-to-have device. If you are traveling with a friend, discuss which items you could share to save space. A laptop is a likely contender for this. TSA is changing the screening process for electronics. These will have to be screened separately in future, so make sure they are easily accessible when you check in. You don’t want to be miserable during a 12-hour flight. Small items like lotion, earplugs, an inflatable neck pillow and a few of your favorite hard candies can do much to alleviate the discomfort of air travel. Any essential medications should already be on your carry on checklist so that they are nearby when needed. Make sure you have enough medication for your entire trip and get permission in advance for any liquid medications. A change of clothing can be a great source of comfort in the event of a long layover or delay. Roll the items instead of folding them to save on space. Wear a warm lightweight jacket onto the plane to avoid packing it anywhere and so that it is close at hand. If they are allowed in your carry-on luggage, a couple of snack bars are a must, especially if you don’t like airline food. Keep your credit card with you, some airlines don’t accept cash for in-flight purchases. Anything irreplaceable should be kept with you at all times. I always use a front pocket travel wallet. Good quality Ziploc bags are great for keeping your toiletries from spilling all over your bag and keeping small items separately. Always carry only the most essential toiletry items in your carry on. The airlines have strict policies when it comes to liquids and you will be able to buy most of your requirements on arrival. A small tube of toothpaste (under 100 ml), some face wash (50 ml) and a disposable toothbrush also come in handy. Pack a comb instead of a hairbrush. Other essentials include sanitizing hand wipes, a small medical kit containing painkillers, plasters and burn medication, and a compact sewing kit. You’ll be surprised how much space you save by following our carry on checklist. Now all you have to worry about is how to beat the jet lag. When preparing yourself for a forthcoming holiday, there are a number of things to think about in the weeks leading up to you leaving. 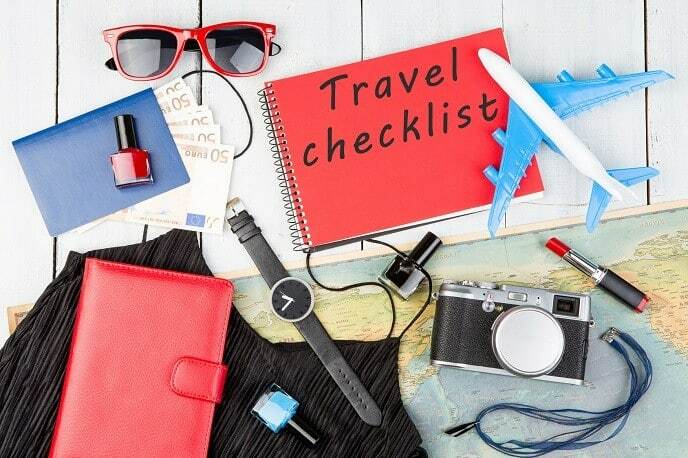 In order to assist you with your preparations whilst also ensuring you don’t miss anything important ahead of your departure, read on for a checklist that you can follow which starts three weeks before you go. Do some research to discover whether or not you or anyone you are travelling with requires a visa to enter the country you are going to as you will encounter problems if the relevant visa is not in place when you arrive. Arrange how you are getting to and from the airport from your house; calling a local taxi firm with your flight details or discussing the time you need to be picked up with a friend or family member if they have offered to take and pick you up, or checking the time table for local transport. If you are travelling within Europe, make sure everyone on the holiday has a valid EHIC (European Health Insurance Card) and that the details on each are correct. Ensure you have the necessary travel insurance in place to ensure you are fully protected whilst on your holiday. If you don’t have a credit card that offers free transactions from ATM machines abroad (which we highly recommend you arrange for next time you travel), it’s best to exchange some money before you leave. Head to the shops and stock up on the holiday clothing appropriate to your holiday location; for instance, shorts and t-shirts for somewhere hot or thick jumpers and coats for a skiing break! Whilst you are shopping around, find a bookshop and pick up a guide for your holiday destination so you can read up on the area before you travel and have a good idea of some of the things you’d like to do before you arrive. With just seven days to go before you depart, this is the time at which you should ensure you have received all of the necessary travel documentation from your travel agent or airline, checking that the details are correct for each member of the travelling party. Check how much luggage you are allowed to take with the airline you are flying. If your bags are too heavy when you check-in, you could find that you face an extra charge for your bag to be loaded onto the plane, so check beforehand to avoid any unwanted surprises. Once you know the weight allowance, create a list of the items you wish to pack as this will make the packing process far less time consuming and will help to keep track of exactly what you are taking with you. With just three days before you head off on your holiday, now is the time to use your packing checklist and add everything you want to take with you to your suitcase. It is always advisable to check the weight of your suitcase once packed too, ensuring the weight doesn’t exceed your allowance. Arrange with a friend or family member to regularly check on your property whilst you are away; giving them a spare key and the details of where you are staying whilst on holiday so they can get in touch in the event of an emergency. The day before you travel is often the best time to pack your hand luggage, ensuring anything you want with you on the plane is in there along with your passports, tickets, insurance details and hotel information so you have the important documents with you at all times. Go online and check on the airline or airport website that your flight times haven’t been changed. If you are travelling to the airport by taxi, call the company to confirm the time they will be picking you up the following day and how much it will cost. Ensure all windows and doors are locked before you leave and that any electrical appliances have been turned off and unplugged. After following this checklist, starting three weeks before you leave, you should have everything in order so all that will be left is to have a fantastic holiday wherever you are travelling to! With spring in full bloom, it’s time to look ahead to the warmest months of the year. Ironically enough, these are the months where most of us choose to escape the United Kingdom for even warmer climes. From the French Riviera to the Red Sea the world is your oyster. But, be sure that you don’t forget your preparation! Use this list as your checklist. The most obvious of them all but they have to be kept up-to-date. Overlooked more than you think, an out of date passport can be a nightmare – even if you notice it before departure day! A one week or one day rush can set you back £130! Being British we are fortunate to be able to get to a lot of places without a visa. But, if you are going to Africa, Australia or America (even on connecting flights!) you will need to register for a visa. When going on holiday, keeping documents close by is a great idea. You can usually check-in online and this will give you the option of printing boarding cards so that you avoid the airport queues. Arguably, the most important part of any holiday, Summer Holiday Checklist. Everything from luggage to extreme sports can be added to your policy and it gives you the piece of mind that you won’t be stung if an accident does happen. Probably the last thing on your mind when you think of your much-needed holiday but it could literally save you thousands of pounds. Transfers and/or parking should be arranged well in advance while at the other end you should know where you’re going from the airport – be that in a car or a taxi to your hotel. Money – Always take a bit of cash in your pocket to start with to help with small purchases like foo and drink. Never change currency at the airport and see whether you can get debit cards that aren’t charged overseas to stop additional fees from hitting your account. Readily available across the globe, you should be able to find good deals before jetting off. Get a good factor and be cautious in the sun. Paracetamol, diarrhea tablets and painkillers are also commonly found in luggage. Exotic foods can sometimes upset the stomach while too much celebrating on holiday may well bring on morning hangovers! Always try to take hair products, soaps, gels, toothbrushes, toothpaste and razors. While you can find them wherever you go if you can be prepared then you won’t have to waste time finding them! Swimwear and you’re ready right? Remember your staples of a t-shirt a day, consider if you need socks or will be wearing flip-flops. Don’t take too many clothes but try to have sensible footwear, a hat and sunglasses. Even if you’re going somewhere warm, a pair of jeans and a jumper are always good additions. Now you are all set for a great Summer Holiday Checklist! If you’re spending a lot of time poolside, don’t forget to take some good books. One last thing, make sure you’re camera’s in full working order!